A pole barn is a versatile structure that can be used for a wide variety of purposes. People often choose to build pole barns on farms. A pole barn can be used on many types of farms for several purposes and can be customized to suit the farmer’s specific needs. If you raise animals on your farm, you need a place to shelter them at night. An agricultural pole building can be used as a shelter for horses or livestock. It can be partitioned into stalls so each animal has its own space to prevent conflicts. Stalls can be made in the right size for a specific type of animal and can be arranged in nearly any configuration. An agricultural pole building can be used to store a variety of things on a farm. If you raise animals, you need a place to store their hay and feed. A pole barn is the perfect solution because it is a large building with an open floor plan that makes it easy to move hay and feed in and out. An agricultural pole building can provide shelter from rain and snow to prevent moisture and mold that could ruin the animal feed. If you use your farm to raise crops that you sell, you probably have a large amount of farming equipment that you use to plant, tend, and harvest the food. Tractors, combines, and other types of equipment need to be protected from rain, snow, and extreme temperatures that could cause them to rust or make them not start. A pole barn is the perfect place to store farming equipment. With an open floor plan and large doors, it is easy to drive a tractor or other equipment in and out of the building. It will be kept shielded from inclement weather to prevent damage so you can tend and harvest your crops on schedule. An agricultural pole building can be used to store vehicles that you use on your farm. If you raise horses, you probably have at least one trailer and a truck that you use to haul it. Those vehicles need to be protected from harsh weather. A pole barn can be built in the right size for any vehicle. 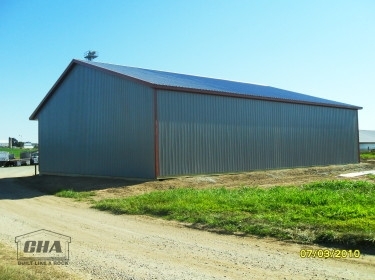 A pole barn is the ideal solution for your agricultural storage needs. Whether you need a place to store vehicles and equipment, a safe place for your animals to rest, or a place to store their feed, a pole barn offers the size and versatility you need. A pole barn can be designed in a variety of ways and can be customized to suit your individual needs. CHA Pole Barns has designed and built pole barns for many people who operate farms. We can work with you to design a pole barn that meets the specific needs of your farm. Contact us today to get an estimate.